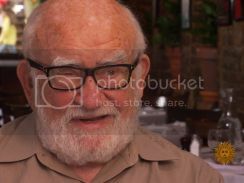 "But in addition to acting, Asner has another passion: Politics. He feel his activism ended up getting 'Lou Grant' canceled. He became President of the Screen Actors Guild, but created controversy with his liberal stances. Even today, Asner is taking on hot-button causes, arguing against Israeli settlements in the West Bank, and narrating a video that questions official accounts of what happened on 9/11. "No one wants to hear destruction of the American myth that some elements of government were involved in 9/11," Asner said, asking, "Why did it take an hour for the strongest nation in the world to get planes in the air - for an hour?" "You underestimate incompetence?" Braver asked. "I guess it was all around that day," he replied. "Do people say to you, 'Okay, this guy is kind of a talented nut job'?" "Yeah, but I'm old enough that I can say, Yeah, yeah, yeah ..."
Joe on Mon, 10/01/2012 - 4:17pm. Shows Building 7 coming down on CBS! 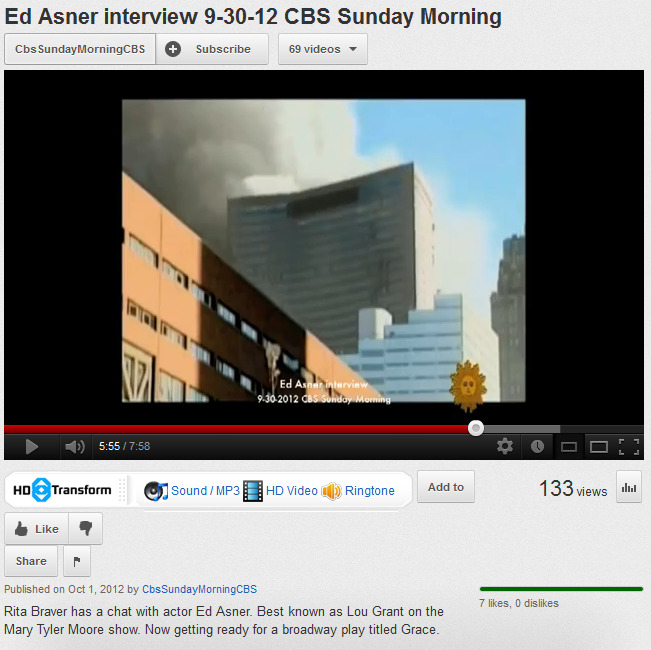 I think this is the first time since Geraldo's show that a national TV program showed Building 7 imploding. Also shows Asner narrating about "Architects & Engineers." That's pretty sweet -- you gotta admit. Could someone edit this video to show the 5:02 - 6:28 mark and then try to embed it on youtube? RL McGee on Mon, 10/01/2012 - 8:57pm. Joe on Mon, 10/01/2012 - 10:48pm. A few supporting comments but the sock puppets are out bad mouthing Ed. Ynda on Mon, 10/01/2012 - 5:07pm. Nice little video and I found it refreshing to see a legitimate play on Broadway which is often rightly called Iowa on the Hudson for its déclassé and pandering musicals. Peter ORourke on Tue, 10/02/2012 - 12:51am. I lived in a dorm at Wellesley 1971-72, officially I lived there, no less. Think Ol' Hil Baby is checking out Solving the Mystery of WTC 7 as we speak? David Slesinger on Tue, 10/02/2012 - 12:58am. Why was no one responsible for the incompetence fired, dismissed, charged, demoted etc? And if it was incompetence why did the system suffer this incompetence on just this one morning after having functioned so well for decades? DCRocker on Sat, 10/06/2012 - 2:04pm. johnekroll on Mon, 10/29/2012 - 6:29am.